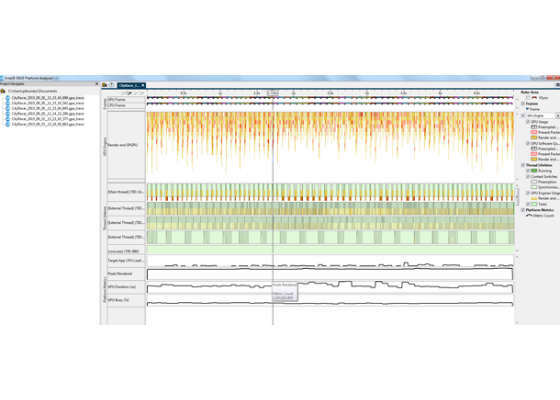 Intel® Graphics Performance Analyzers (Intel® GPA) Platform Analyzer visualizes the execution profile of the tasks in your code on the entire platform over time, on both the CPU and GPU. This helps you understand task-based issues within your game, enabling you to optimize the compute and rendering tasks across both the CPU and GPU. 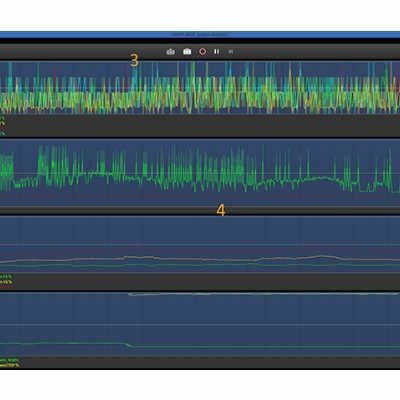 Intel GPA Platform Analyzer uses trace data collected during the application run to provide a detailed analysis of how your code executes across all threads and correlates the CPU workload with that on the GPU. 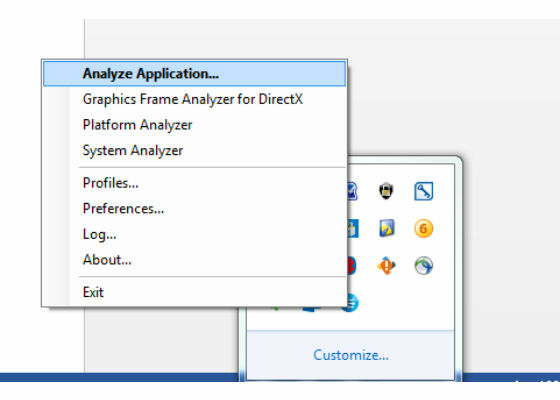 Previously, we shared how to do an analysis using the Intel GPA Frame Analyzer for DirectX*. In this article we are going to do a walkthrough of how to do CPU-bound offline analysis of the workflow. 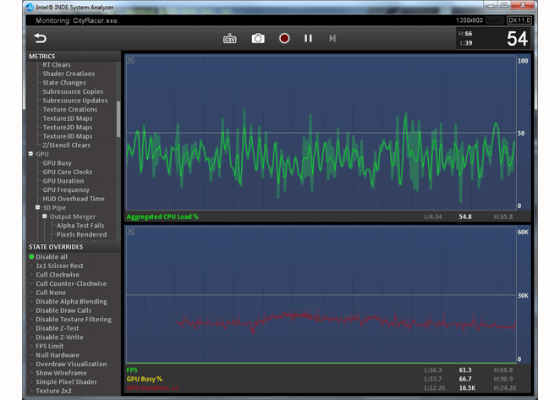 Click Analyze Application as shown below. This feature allows you to browse the binary to the game that we want to analyze and run it. The Intel GPA monitor injects the code into the game to extract the profiling data. 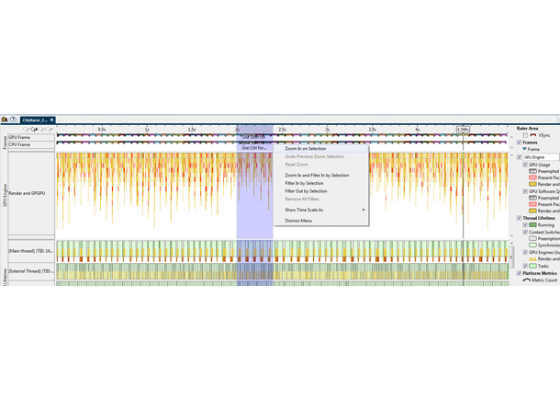 If your application is CPU bound, capture a trace so you can open in Intel GPA Platform Analyzer and do profiling for that application. If the application is GPU bound, capture a frame. If you are using Intel GPA System Analyzer, click the camera button for capturing frames or click the red record button for capturing traces. In you are using HUD shortcut keys, by default Ctrl+Shift+C is the hot key for frames and Ctrl+Shift+T is the hot key for trace capture. 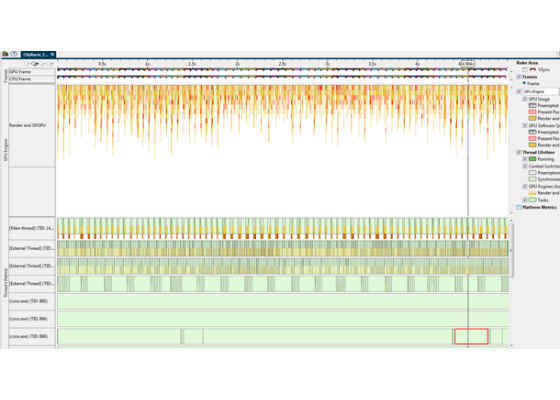 We will do a trace capture to analyze using the Intel GPA Platform Analyzer as shown below. Open the Intel GPA Platform Analyzer. On the left side is a list of traces. Double-click the latest trace captured. Once the trace opens, you will see a few different windows as shown below. 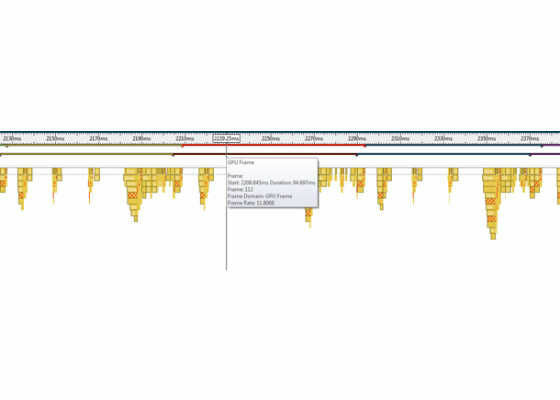 Once the trace loads, the main windows displays the timeline of all the data in relationship to the time. At the bottom of the windows you see all the metrics that are enabled and recording while capturing the trace. At the center of the screen you see all of the threads that were running at the time of capture. 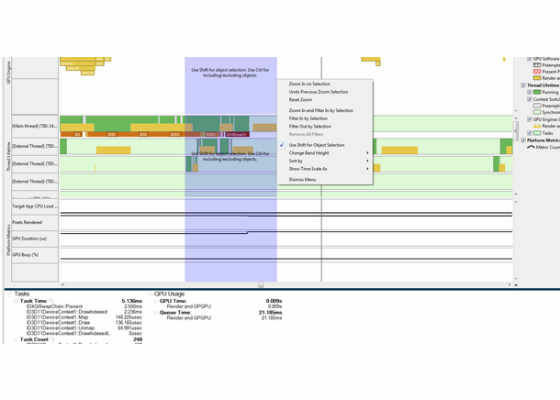 At the top you see the GPU frame delimiters and CPU frame delimiters and what tasks were occurring. Let’s focus on CPU offline analysis. Notice that the duration of the trace is around 5 seconds long. This can be modified in the profiles section of the graphics monitor. Let’s zoom in to see the smaller section of this trace. Clicking and dragging a section (using the left mouse button and then releasing) zooms into that section. Zoom in to get three frames with the data as shown below. Now that we zoomed into the three frames, let’s look at the individual columns. 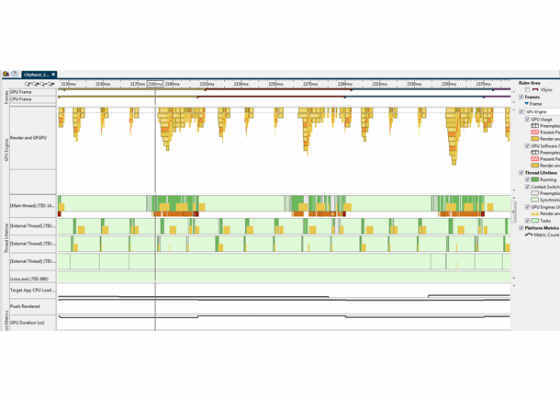 In the frames columns you can view individual GPU and CPU frame timings. Notice that the colors correlate to the same CPU and GPU frames. For example, the CPU 112 frame is the same frame color as the GPU 112 frame. We can looks at individual durations and also calculate the difference between when the CPU frame started and when the GPU frame started. 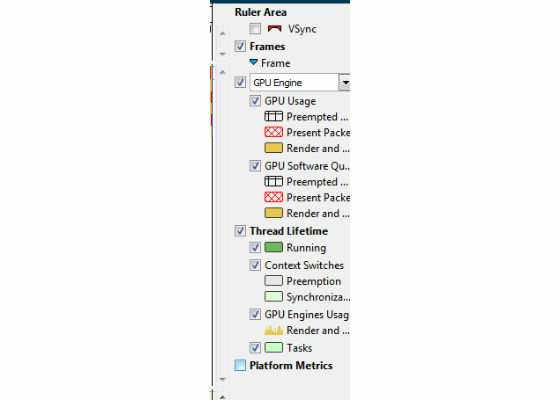 Everything above the dotted line is executing on the GPU. The red cross-hatched areas as shown below are the present calls. You can trace a present call from when it originates to when it is executed. You will see when a present call is executed and when the GPU frame is finished, which helps calculate the single frame latency. 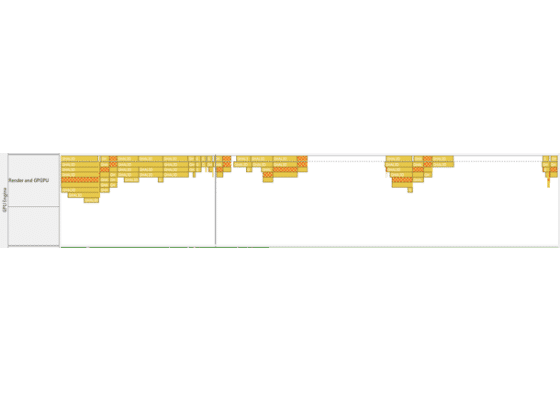 You can see when the present call is submitted by the CPU and when it is completed by the GPU. You can view when the thread was running, when the OS needed to switch the context, and when there was synchronization. 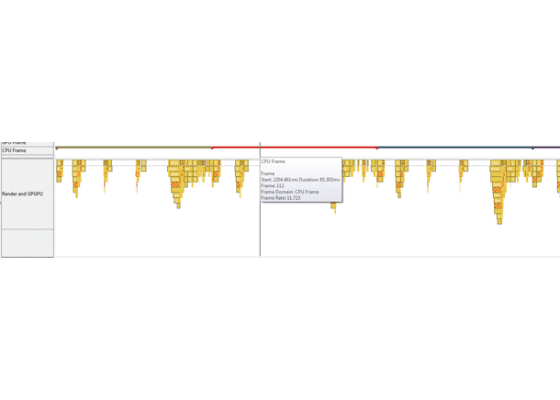 In addition you can see the GPU work overlayed on the thread, which can help correlate when the GPU or the CPU is busy, identifying whether the workload is CPU bound or GPU bound. You can view each of the DirectX API calls as well as user-defined calls if available. The metrics that display here are the metrics we set up in the HUD profile. If a trace is taken using Intel GPA System Analyzer, the metrics are the ones in the Intel GPA System Analyzer at that time. This pane will update, synchronized with your selection. Depending on what you selected, this pane displays GPU usage, OpenCL™ kernels, or tasks such as user-defined functions or DirectX calls. 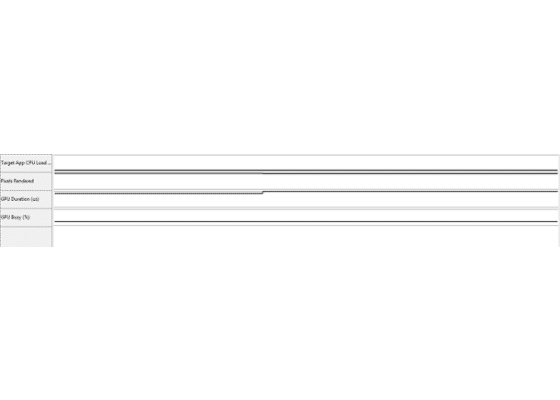 The pane can also identify hotspots in certain areas in the trace. For example, if you highlight a section, the statistics pane changes as shown below. 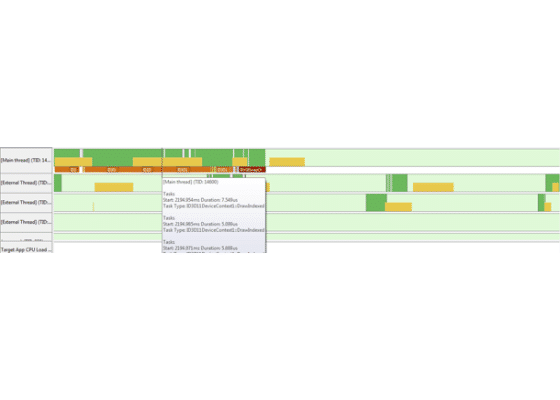 You can see the task time for the selected area, the GPU time, and the GPU queue time. You can turn off some of the sections to make the UI less complicated. You can clear a check box to remove that section. Performance varies depending on system configuration. Check with your system manufacturer or retailer or learn more at intel.com.